Mole control in Fife, Perth and Kinross by Active Pest Solutions. Active Pest Solutions receives regular calls to deal with mole infestations throughout Fife, Perth and Kinross-shire. Over the last 15 years of providing mole pest control, we have found that using quality mole traps, expertly set, is the most effective form of mole control. We are a member of the Fife Trusted Trader Scheme and our mole control services have been checked and vetted for good work practice by Fife and Perth and Kinross Trading Standards teams. As a Trusted Trader, we are included in the Perth and Kinross Better Business Partnership. Moles are generally solitary animals, but during the mole breeding season – from February until June – they rush around breeding and feeding. This increased activity is very visible at this time of year, when mole hills suddenly appear everywhere. The resultant unsightly damage caused by molehills on farmland, gardens and sports surfaces etc. can become a big problem. A mole litter may consist of up to seven moles, and after about five weeks of being looked after by their mother the moles will set out to find their own territory – giving plenty more potential for further mole control issues. An average mole life span is three years, so if you currently have a mole hill or two and want to prevent it becoming a big mole problem in the not-too-distant future, call us now on 01577 862 035 or 07764 768 151 for professional mole control, advice and help. Active Pest Solutions’ expert mole catcher responds quickly to prevent further damage to property as well as to reduce the distress caused to property owners like you. We have dealt with mole infestations on farms near Glenrothes and have undertaken mole control in Cleish fields where moles were undermining the ground on which horses and other livestock were trained or grazing. 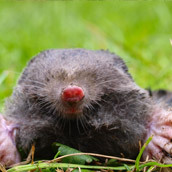 Collapsing mole tunnels can cause injury to animals and humans, both of whom can sustain ligament damage or sprained ankles after stumbling in mole runs. Active pest solutions were also called to provide mole control in Kirkcaldy after moles had damaged a sports playing area. The problem was rapidly solved so the games could go on! Mole pest control can also be undertaken using poisonous gas. Aluminium phosphide gas can be used by trained operatives. Active Pest Solutions hold certificates proving that our operative is fully trained in the use of this sophisticated mole control technique. For example, we recently used gas mole control to treat a serious mole infestation in Leven, where newly planted trees were having their roots significantly undermined by mole activity. You can also request this method of pest control for rat pest control and rabbit pest control if necessary.